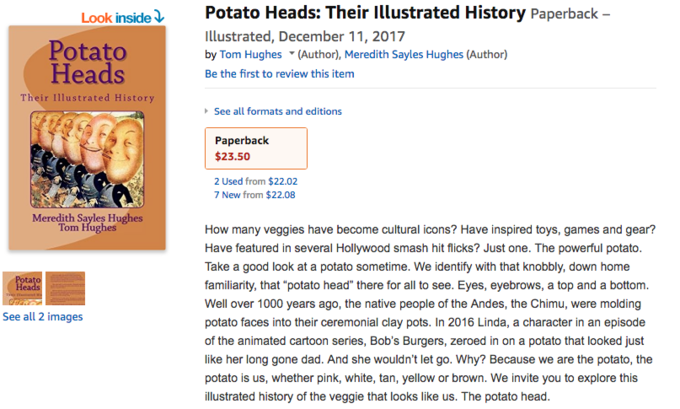 "Buried Treasure: Roots and Tubers"
"Potato Heads: Their Illustrated History"
"Hot Potato Capital of the World: DC Nickname Campaign"
Every city has a moniker, a nickname to call its own, but there is none for our nation’s capital. DC Nickname Campaign nominates: “Washington DC: The Hot Potato!” Perfect, right? No city on earth has juggled (tossed, dropped or passed) as many hot potato issues as good old “no taxation without representation” District of Columbia. Hot Potato: n. inf. A controversial issue or situation that is awkward or unpleasant to deal with. ---Oxford Current English Dictionary, 2009 WDC: where devilishly difficult to resolve issues are tackled or not every day by all branches of government, executive, judicial and congressional. This book is about my long-standing belief that Washington, DC is indeed “The Hot Potato.” A nickname it has earned. An association with the noble tuber that is fitting and complimentary. After all, potatoes are significantly more valuable and versatile a commodity than apples any day. And potatoes are all American in origin. Apples come from Kazakhstan. Apple pie is not really American, but any way you prepare them, potatoes are. Better to be identified with the world’s number one vegetable than a fruit that as the saying goes: “it takes only one to spoil the barrel. Thirty years ago, my wife and I opened the world’s first museum dedicated to potatoes in a gallery space of our Capitol Hill townhouse. Here’s part of a New York Times article from that time. “Mr. 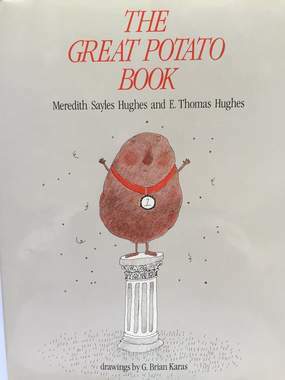 Hughes, who says the potato provides more food value per acre than rice or wheat, quotes approvingly from Hymn to the Potato, by the Brooklyn poet Menke Katz: "On the hungry alleys of my childhood, the milky way was a potato land." “Asked why the potato museum is in Washington, Mr. Hughes explained that ''it should be in the city where every day people are handling hot potatoes. Can you think of a city that handles more hot potatoes? ''He said he had urged Mayor Marion S. Barry to get Washington formally called the Hot Potato, as New York is called the Big Apple. ‘I'm getting a little tired hearing all that Big Apple bit,’ he said. ‘The potato is a hell of a lot more nutritious and more versatile and economically more important than apples ever will be.’'' But in DC, especially on the president’s desk, in the halls of Congress and at the Supreme Court’s bench, is where the hottest potatoes of all land. If they could be handled by others they would. Over the years, hot potatoes pertaining to wars, rights and financial affairs have been ever present issues making headlines in Washington. Others such as civil service reform and tariffs (high, low or abolished) have been potatoes so fiery to handle that they were passed on through a series of administrations during the nation’s “gilded age.” Some were one time affairs. WDC may qualify as the one place beyond needing a moniker or motto, but that doesn’t prevent a legion of PR types, tourism touts, promoters, image builders, editors, journalists, headline composers, song writers, novelists and me from thinking it needs one. We’ve got a point. Who wants to keep writing, reading or hearing “Washington-this and Washington-that” endlessly? The time for a catchy nickname is long past due. 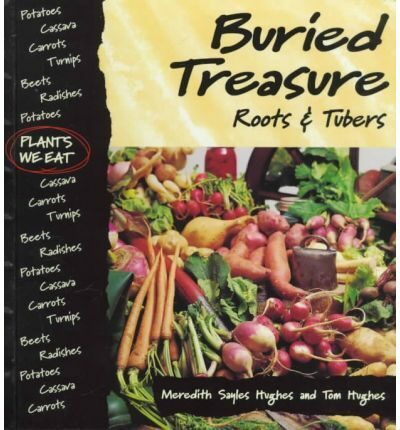 The book includes lists of "hot potatoes" handled over the nation's long history. It also is full of fun and games that make learning about American political history enjoyable for a wide range of audiences.